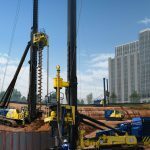 Ninetimes has completed an animated movie demonstrating the use of a TEI rock drill excavator attachment in a hollow bar soil nailing earth retention application. 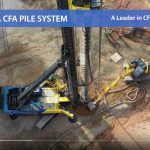 The video presentation incorporates all construction phases and equipment required for this unique geotechnical process. The animated movie displays the TEI rock drill working in conjunction with a hydraulic excavator and portable grout mixing plant to improve soil stabilization with hollow bar soil nails. The video presents a transparent below ground view of grout being emitted from the drill bit at the end of a steel hollow bar to create reinforcing anchors deep inside an unstable hillside. 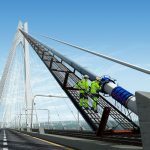 The Ninetimes-created animation includes 3D models of the various drilling platform components and a digitally illustrated geotechnical construction site. The equipment’s 3D shapes were produced with Adobe Illustrator and their realistic textures, colors and lighting were created with Maxon Cinema 4D software. The static background illustration of the jobsite and the below ground cutaway image were designed as multi-layered files with Adobe Photoshop. Music, sound effects and voice-over were added to fully develop the hollow bar application narrative. The video was produced in both English and Spanish languages with additional versions developed with branding specific to individual hollow bar material manufacturers. Please contact Ninetimes regarding animation and original illustration for your marketing needs.